Centreville physician John Waits was the only Alabama physician to be recognized by the National Organization of State Offices of Rural Health’s 2017 Community Stars Program. Dr. Waits was one of 31 honorees during the 2017 National Rural Health Day working tirelessly to improve, protect and advance health and wellness in our rural communities. “From the time we opened in 2004, we decided to never turn away a patient due to an inability to pay. We’ve held to our promise even when unemployment in the area went from 3 percent to 15 percent, and more patients found themselves without insurance.” The words of Dr. John Waits speak to the heart of why he is most deserving of recognition of an outstanding 2017 Community Star! Dr. Waits is a practicing, board-certified Family Medicine/Obstetrician and leader in the field of innovative, rural health care. He serves as CEO of Cahaba Medical Care and is the Director of the Cahaba Family Medicine Residency Program. He also created Alabama’s only Teaching Health Center, which has a dually accredited family residency program within Cahaba Medical Care. 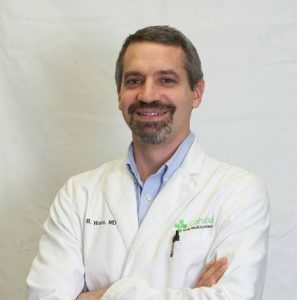 He currently serves as the co-founder and CEO of Cahaba Medical Care Foundation, a Federally Qualified Health Center in rural Bibb County, Alabama. Dr. Waits is particularly interested in healthcare policy as it relates to women and children (maternal and infant care), the rural poor, health care access, and the care of the uninsured and underinsured. Under his leadership, CMC’s mission to treat people in underserved communities regardless of insurance or financial status is steadfast. He believes that it is critically important to offer patients the highest quality care the team can provide, while also providing the most extensive scope of services possible. Dr. Waits and the care CMC provides extend beyond the walls of their practice locations. CMC is very active in community service, giving weekend backpack meals to children in three of Bibb County’s schools, with plans underway to expand the program into neighboring Jefferson County. CMC is a ‘no restrictions’ community service organization in that they also provide support to a local food bank and a clothes closet for all those in need, patient or not. Another notable area of his reach and community benefit results – CMC has expanded into mental health and nutrition, offering counselors and dietitians to community members in need. He and his loyal, equally dedicated team are motivated by the idea of investing in communities, working and partnering with others to try to make people healthier and places better.